“Throughout his career, Robert Downey Jr. has mesmerized audiences by capturing the humanity in larger-than-life characters like Charlie Chaplin, Sherlock Holmes and Tony Stark." And let's not forget RDJ's roles in The Judge, Zodiac, The Soloist, and so, so many more incredible films. He overcame addiction and came back better than ever, and he barely seems like he's missed a beat. RDJ has made a lasting impression on Hollywood and his audience, and this award is just a small token of our appreciation. 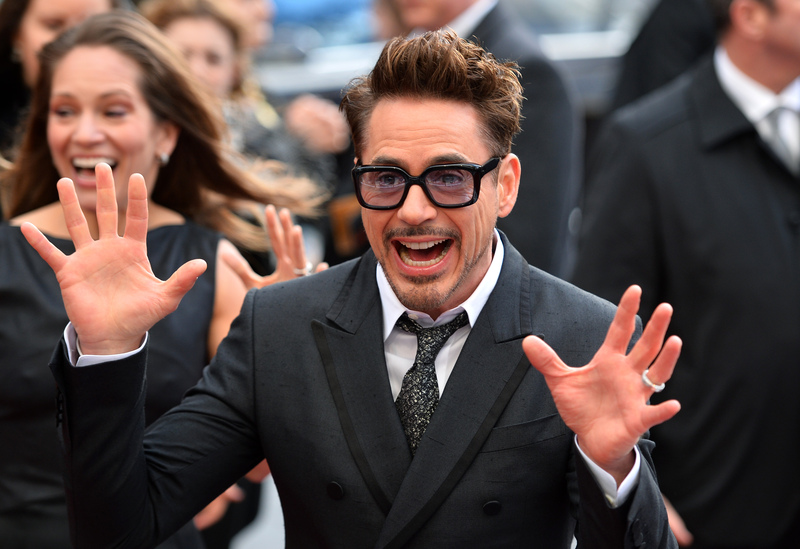 This award frequently leads to funny and inspirational speeches, and RDJ was no exception. After Avengers costars Chris Evans, Scarlett Johansson, Chris Hemsworth, Mark Ruffalo, and Jeremy Renner gave their presentation speech, RDJ appeared on stage, dancing like the glorious guy he is. The Avengers all proceeded to take a knee while he spoke, because when RDJ speaks, you treat him with some full-on R-E-S-P-E-C-T.
RDJ went on to show us his classic sense of humor, be classy and gracious ("If a man is judged for the company he keeps, then I must be doing something right," referring to his merry band of insanely attractive and heroic presenters), and inspire the entire audience ("Dream big, work hard, keep your nose clean, be of service, and, yes, because you can, define your generation"), who might have juuuuust a touch too young to understand the gravity of his nose joke. Still, it's inspirational as ever. Needless to say, receiving the MTV Generation Award is a seriously huge honor — it's not just another popcorn bucket for RDJ to put on his mantle. This award represents his hard work and serves as a symbol of just how awesome he is. He's in good company, too — previous recipients of the award include Johnny Depp, Reese Witherspoon, Ben Stiller, Sandra Bullock, and Tom Cruise. After seriously turning his life around, it's great to see RDJ receiving such a prestigious award — he truly has defined his generation in a way that no one else could. May his snark and blue sunglasses inspire us all for years to come.